I've been watching One Ale of A Job, Channel 5's series about Marston's Brewery. The dodgy puns - delivered by Pub Landlord comedian Al Murray - don't end with the title and I had pretty low expectations of what looked like, and to be honest is, another cheapo fly-on-the-wall documentary. Having said that, it contains some interesting stuff about brewing, cellar management and beer dispense and is the first TV series about beer and brewing I can remember since Michael Jackson's Beer Hunter in the late 80's. I'm on a bit of a Thomas Hardy binge at the moment: in the last month, I've read four of his novels and some of the short stories too. 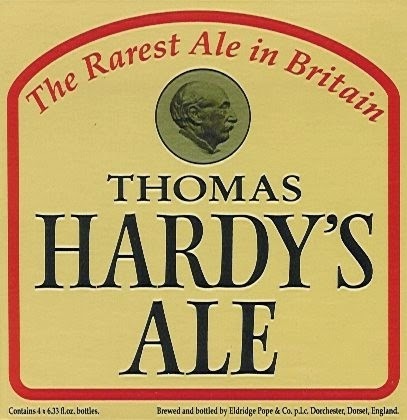 There's lots of stuff in Hardy about ale, cider and pubs, including landlords and farmers brewing their own beer in mid-nineteenth century South Wessex (Hardy's name for his native Dorset) rather than buying it from breweries. The relatively late arrival of the railway in that part of South West England which he also mentions might have had something to do with that. One thing that caught my eye in A Tragedy if Two Ambitions, a short story Hardy wrote in 1888, is a character talking about a pub having "the rarest drop of Old Tom that I've tasted for many a year", showing that other brewers were making strong ales called that before the famous one from my local brewery Robinson's, first brewed in 1899 by a brewer who drew the face of the brewery cat in the brewing log.